Rambling Librarian :: Incidental Thoughts of a Singapore Liblogarian: What would be the 50 objects that represent Singapore to you? What would be the 50 objects that represent Singapore to you? Back in September, a friend pointed me to this NYT article about a project in New York City that asked historians and museum curators to name 50 objects that could "embody the narrative of New York". Top of the New York list was a Mastodon tusk. The 50th item was something called a "Meng Political Sign, 2012". The former referred to the first recorded discovery of mastodon remains in 1858, in a borough in New York city. The latter turned out to be a political campaign poster of a Ms Grace Meng. She won the Democratic Congressional nomination in Queens borough. That tidbit was a segway to how the city's residents of Asian origin exceeded one million for the first time, as recorded in the 2010 Census. 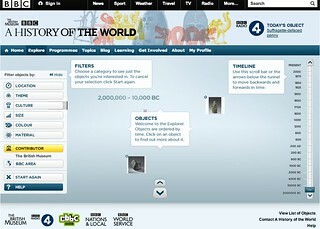 That project in New York was inspired by the British Museum’s BBC radio series and book, “A History of the World in 100 Objects". Item One on the British Museum's list was the Mummy of Hornedjitef. The 100th item was a Solar Powered Lamp and Charger. Detractors might say that was rather presumptuous of any institution to claim that their collections definitively represented "The World's" history. Equally arguable would be that the 100th item should have been a MP3 player or Xbox (dare I say, iPhone?) rather than a solar-powered lamp and charger. I found the concept of a "100 objects" listing -- one that symbolically represent a certain perspective of the world -- a refreshing one. Got to give it to the Brits for such a simple and innovative way to curate and present items from their Museum's collection (notwithstanding the joke about Colonial British plundering and shipping back treasures from all around the globe). The British Museum has also created an interactive visual browse page (Flash-based), based on time and filtering by other facets. The “History of the World” was limited to objects in the British Museum’s collection. Like that list, ours “can only be a history” and “not the history.” And because it is a people’s history, we are inviting participation. Tell us what objects represent New York City to you in the comments section. The New Yorkers invited public comments after an initial list from historians and museum curators. The British Museum didn't solicit public contributions it seemed. I think to truly make it a "people's list", everyone should be given a chance to create their own right from the start. A Singapore "100 objects" list? The article instantly captured my imagination, since the Singapore Memory Project occupied a large part of my work time (and maybe off work too). 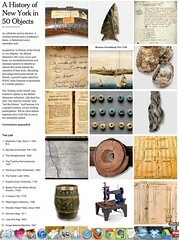 I wondered what a "50 objects that represent Singapore's History" would look like. I posted this on Facebook, inviting FB contacts to also name 50 objects they consider to be representative of Singapore's history. Walter Lim - A pair of spectacles since we're the most bespectacled nation in the world. Low Hei Chin - Four stones. Dex Khor - A rotan. Bernadette Daly-Swanson - Definitely Pierre Balmain's iconic kebaya and sarong for SIA... Had one made when I was there in 2009. I need to come back for IFLA! Dex Khor - The Ultimax 100 SAW. Sold to Bosnia with pride! (Alec Ng)... and the document on the proclamation of independence for Singapore. Low Hei Chin - ... Stamps and coins from that represent significant events / moments in our history? First day covers? I can only think of dinky toys or toy soldiers (Deetail) that depict WWII. Hikaru Teo - Well the banana note would be a notable representation of life during the Japanese Occupation. Ivan Chew - The POSB logo! Regina De Rozario - I've just gotten into reading excerpts and commentaries on the correspondence between Raffles and Farquhar and I would add the letter written by Farquhar after he was dismissed by Raffles (for not following the latter's town plan and vision to a T). Low Hei Chin - Our national flower! Ivan Chew - The Tembusu tree. Cos it appears on our $5 note. Ivan Chew - Teamy the Productivity Bee. Ivan Chew - Singa the Courtesy Lion. Ivan Chew - The SAF Reservist Booklet (now defunct). Ok, 25 items isn't bad. Some items were totally off my consciousness until others mentioned it. Like the Singapore-made Ultimax 100 Section Assault Weapon (SAW). Some objects -- like the 'rotan' (i.e. cane) -- encapsulates so many things past and present: parental methods in bringing up children, school discipline, criminal code and the penal system, a national event (remember Michael Fay?). I'm sure each of us can come up with our own list of 50 items. Or at least 20 items easily. New items would make it to the list, as per recent events. I can think of Amy Cheong. Ok, technically not an "object" (I'm sure you know I didn't mean to say she's an object) but what the heck, it's a 'people's list'. We could flexibly cover Events, People, Places in the same list or separately if we choose. Analysing an aggregation of lists might reveal the psyche of individual citizens. And quite likely our psyche as a nation. 26. Low Hei Chin - Meant to write this earlier but did not get around to doing it. How about those khong Guan biscuits with a colorful icing sugar on top? 27. Adrian Tan - I wanted to say, "Kelong!" I think it is unique to Singapore. 29. @JustinZhuang - Anti-Littering man! 31. ...A citizen pass for the casinos. 32. ... WP 2012 flag. Musically, it must be 'The Crescendos' first ever recording from an international label which opened doors for other pop bands and artistes in the 1960s. Singapore being a "Fine" city! Fine on littering, spitting etc. Also, not forgetting that we are a gum-less city. Having a Botanical Garden within 5km of the city centre should also be another of our milestones! For me, it's the hawker centre. While it cannot replace the roadside hawkers of pre-70s S'pore, it is nevertheless a quintessentially S'porean experience. Every hawker centre, no matter how sterile or dinghy, makes me happy to be a Singaporean.